Mitch James’ journey has taken him from sleeping rough and busking on the streets of Europe, to topping charts, performing sold-out shows, and now, his debut full-length album. Even before the release of the upcoming record, the Kiwi singer-songwriter has amassed over 30 million streams from the handful of songs he’s shared - including ‘No Fixed Abode’,‘Move On’ and ‘All The Ways To Say Goodbye’. The new chapter in James’ story begins with the album’s lead single ‘21’. 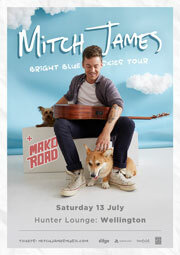 The reflective, acoustic-driven track was co-written in Australia with emerging songwriter Mike Waters and showcases a maturity and growth in James’ song writing abilities. ‘21’ captures the nostalgia Mitch feels towards a period “where you have no worries and don’t know how good you have it,” he describes it as a love letter to the people he’s been close to, and the place he loves most in New Zealand, Dunedin. On song writing he says “We are in this place with pop where everything feels a bit like a jingle, there are great melodies out there, but there’s no real substance for people to cling on to, I wanted to give people stories - stories that they can relate to.” It makes way for an incredible debut record. A raw and honest collection of songs written over the course of 18months, but based on the tangible experiences of his lifetime. It also sees the 23yr old artist pushing new ground in the studio -seeking out some of New Zealand’s most well-known musicians, Ji Fraser and Eli Paewai from Six60. Recorded and produced at the legendary Roundhead Studios in Auckland with Simon Gooding, Fraser and Paewai took on the roles of executive producers, with fellow Six60member Chris Mac also lending a hand. James cleaned cars to save enough for a one-way ticket to London and headed off to chase his dream - having never before played a live gig. What followed was three years of hard graft. His first song ‘No Fixed Abode’ hit #1 on Spotify’s Viral Chart, has racked up more than 17 million streams and is now certified gold in Sweden. In December 2016, he followed it up with his official debut ‘Move On’, which achieved #1 NZ airplay and #2 in the Spotify Viral Chart. It’s since had more than 2.5 million streams on Spotify, while ‘All The Ways To Say Goodbye’ has topped more than six million. nationwide headline tour in a Kombi van, and playing to over 100 thousand when he opened for Ed Sheeran’s three stadium shows in Dunedin.